The eyes of nearly 400 fallen Soldiers and Marines now watch over the graves of their comrades at the Central Texas State Veterans Cemetery. 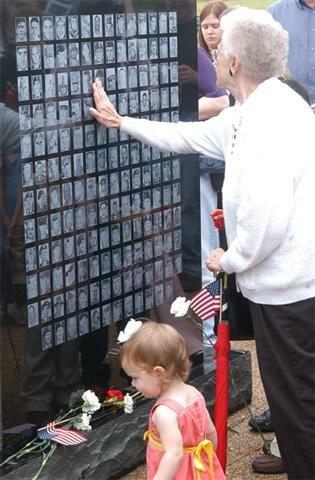 The Central Texas Fallen Heroes Memorial was unveiled during a Memorial Day commemoration May 28 at the cemetery. 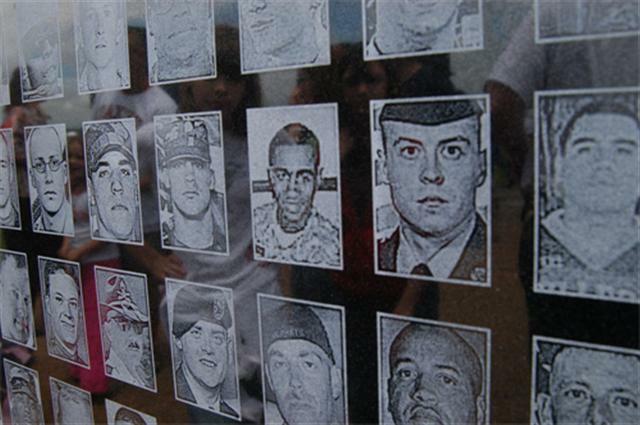 The faces of the fallen from Fort Hood and area communities are etched in walls of black granite that represent those lost from 2003-06. 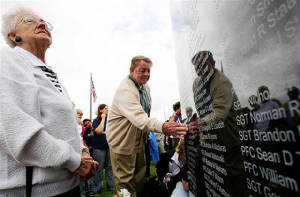 More walls will be added to honor those who have died since last year. The Killeen Police Department raised money for the memorial and collected the 390 names and photos currently in the memorial’s granite. The walls surround a combat display statue. Even small children donated money to pay for the memorial. 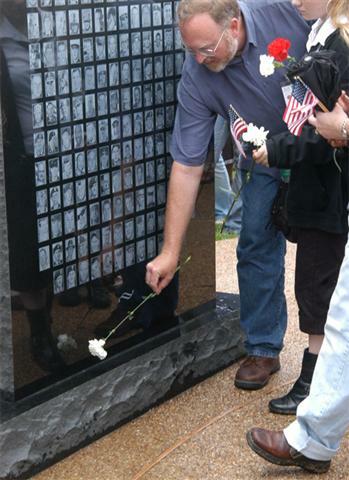 Gold Star Families were invited to view the memorial first as white sheets were lifted off the black granite walls. A local flower shop donated carnations for the Gold Star Families, and many left the flowers, flags and other mementos at the base of the walls. Gary Randall came to see the wall because his best friend from childhood, Spc. 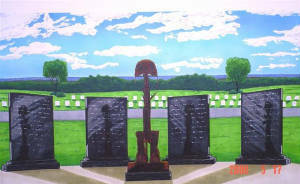 Tracy L. Laramore, is on the wall honoring the warriors who fell in 2004. “This is a sad occasion,” Randall said. The two used to “do everything together. We went everywhere in Killeen when we were kids,” he said, adding they enjoyed going to the movies together and playing miniature golf. The memorial should act as a reminder to the community that Gold Star Families continue to need support, said Army veteran Sharon Joulevette. A ceremony before the memorial was unveiled featured speakers including U.S. Rep. John Carter, R-Round Rock, who said the fallen Soldiers have given Americans the opportunity to say the living are the greatest people on Earth. “I believe that there is something eternally special about the people we call Americans,” Carter said. “We can stand on planet Earth as a symbol of liberty. The ceremony also included a song from country musician Jackie Cox, a performance by the Austin Police Department’s Drum and Bagpipe Corps and a flyby of four World War II-era aircraft. Please take the time to visit the Central Texas Fallen Heroes website, where you can see pictures of each of the soldiers who are memorialized on the granite slabs of this memorial, and read about how the project came about. There is a link on the website where surviving families can make arrangements to receive a frameable high resolution image of a memorial to their soldier.